Wind power is falling rapidly in cost, with turbines becoming bigger and more efficient. Alexandre Jeanblanc at Investor’s Corner explains that Copenhagen plans to become the first carbon neutral city in the world by 2025! Denmark is blessed with abundant wind energy sources, which is part of the explanation for the capital’s ability to put forward such an ambitious goal. An expert from Copenhagen wrote me that “Wind generated 43.4% of Denmark’s electricity consumption in 2017 (Wind power in Denmark), and contributed 48% of total electricity generated in the country. (Denmark imports some electricity. )”* In combination with other renewables, Denmark currently gets more than 50% of its electricity from renewables. . But Jeanblanc points out that the city has greatly increased the efficiency of its public and older residential buildings. (A lot of buildings still don’t have proper insulation, a simple fix that significantly reduces carbon dioxide production). Copenhagen is also addressing transportation, making the city bicycle-friendly and hoping to account for 75% of trips inside the city by bicycle. The remaining automobiles and buses will be electric or hydrogen. 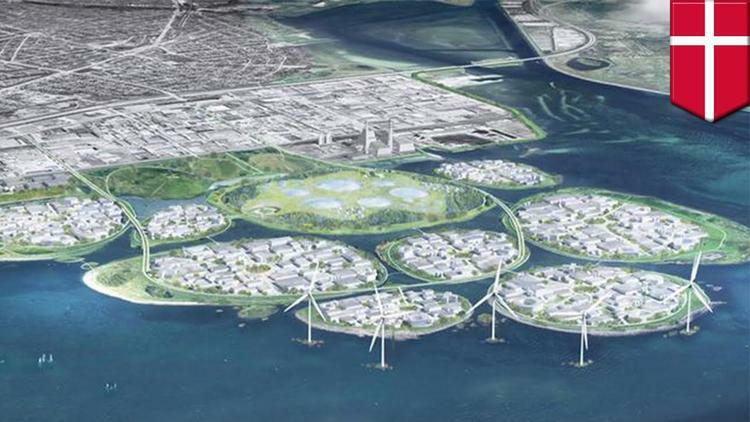 Some ten percent of greater Copenhagen’s households will be powered by wind turbines set up on 9 artificial islands off its coast, with the complex to be named Holmene. Holmene will itself be net carbon zero, and a major new center of industry, including pharmaceuticals. It will have 5 huge wind turbines, each producing 6 megawatts. Denmark is a small country of 5.7 million and the main significance of its ambitious decarbonization plans is that they are a demonstration model available for adoption by others likewise endowed with wind resources. Wind now generates 10% of India’s electricity, and is the largest source of renewable energy in the country. Solar provides about 7% of India’s electricity. With substantial growth last year, India now has 35 gigawatts of wind energy. The country’s total installed electricity capacity is 351 gigawatts. India’s government has ambitious plans for renewables to account for 55% of the country’s electricity by 2030. As a country with 1.3 billion people that is rapidly electrifying the countryside, achievement of that goal would forestall the production of tens of billions of tons of carbon dioxide. (The world currently produces 350 billion metric tons of the dangerous heat-trapping gas every decade, with current lackadaisical policies likely to increase that total substantially by 2029). Costa Rica has increased its installed wind capacity to 407 megawatts, up from only 66 megawatts in 2009. Wind now accounts for 11.5% of Costa Rica’s electricity mix, coming in only behind hydroelectric power. As of summer, 2018, Costa Rica had since 2014 generated 98.53% of its electricity from renewables, including wind, solar, geothermal from volcanoes and hydroelectric. Costa Rica’s main carbon footprint now comes from vehicles, concrete and agriculture, but its progressive president, Carlos Alvarado, has ambitious plans for electrification of transport. Costa Rica is only a little more populous than Denmark, so it, again, is offering a model to other countries– a crucial model, the adoption of which is crucial if the world is to avoid the worst effects of our climate crisis– tropical temperatures, sea level rise, frequent extreme weather events, and insect, animal and fish die-offs. *An earlier version of this posting misstated the current proportion of electricity generated by wind in Denmark as 25%. Informed Comment regrets the error.